"Starting with raw animal fiber and moving it through centuries-old techniques of felting and dyeing to create a piece of wearable art or a sculptured vessel with colors that mimic nature is a real joy for me. Teaching these techniques is my passion." After 30 years as a practicing psychotherapist, Vicki turned to the Lillstreet Art Center and Chicago Institute of Art to revisit her love of fiber arts. She resumed hand weaving, worked on Margaret Wortheim’s first major coral reef installation with the Windy City Knitters and then began exploring felt making and natural dyeing. Vicki found her focus working with raw wool to create wearable art and three- dimensional hollow form sculpture and dyeing fabric with plants from nature. 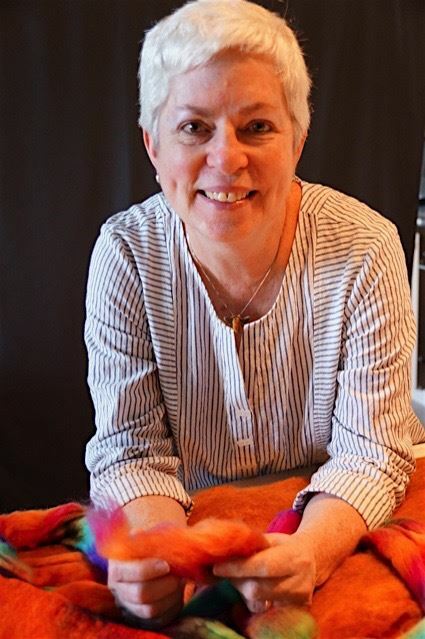 Since leaving Chicago and moving to the Asheville area Vicki has taken time to study with felt artists Karoliinna Arvilommi, Judit Pocs and Charlotte Sehmisch. Vicki teaches at various craft schools including JC Campbell Folk School, Arrowmont, Western North Carolina Arboretum and at Southeast Animal Fiber Fair. She serves on the board of LocalCloth.org in Asheville and has chaired Local Cloth’s Project Handmade, a large scale fashion show that highlights Western North Carolina’s best fiber artists creating design locally, “from farm to fiber to fashion.” Vicki has won numerous awards for her own work in art to wear and felt sculpture; in 2016 she was awarded a first place in The Blue Ridge Fiber Show and the Judges Choice Award at Southeastern Animal Fiber Fair. In the Local Cloth studio on Tuesdays, Vicki will be teaching felting, dyeing and eco print. Each month will have a theme and a small class format that allows for ample individual attention for all skill levels and flexible scheduling. If you are interested in exploring any aspect of wool felt making or natural dyeing, the LC studio on Tuesdays is a wonderful place to find your own direction as you learn new (and old!) techniques. or visit her personal website to find out more about special workshops, classes and events. Classes are non-refundable. Contact Vicki to schedule.